As well as the abundant number of blogs to read on the World Wide Web which provide ideas and tutorials for sewing, upcycling and customising clothes, there are also a number of books available to buy online and in book stores. It is not always necessary to buy such books, your local library may well stock a variety of DIY fashion books, which you can borrow for free. One such example, is this book which I picked up last week whilst browsing the sewing and craft section of my local library; Generation T: Beyond Fashion: 120 New Ways to Transform a T-shirt by Megan Nicolay, published in 2009. 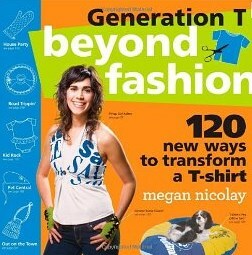 This is the second in the series of 'Generation T' books available by Megan Nicolay, and whilst I have not reviewed her first (108 Ways to Transform a T-Shirt), this particular book receives much more acclaim. Each project comes with an easy illustrated step by step tutorial, and a list of 'ingredients' (materials and equipment) needed to make each piece. There are a number of 'no-sew' ideas, and even the projects that do require sewing can be done by hand with a needle and thread, a sewing machine is useful, but not essential. requires four XL or 3 L t-shirts to make. requires 3-4 t-shirts to make, weaving on the back of a chair. requires 2 L or XL t-shirts to make, in complementary colours. requires 1 t-shirt to make. requires only small loops from the bottom of t-shirts. requires one t-shirt to make, cutting holes with scissors. Having said that, I am impressed with the ideas Megan chooses for her book, proving that the average t-shirt need not be limited to clothing. 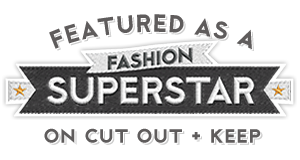 We always knew that t-shirt stretch jersey is a particularly versatile fabric, Megan shows us the humble tee can be transformed into so much more interesting and useful things. Book centre pages, where everything you see is made from the humble t-shirt! Readers, do you pick up sewing, fashion, or craft books from your local library? 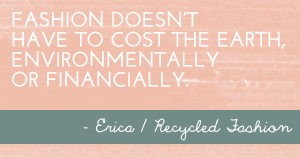 If you do, and are interested in reading more books related to DIY and recycling fashion, I found a great list of others to check out here. Love the idea of checking out the local library for books, I am definitely going to give it a try although my local library is quite small. I tend to borrow fashion books. I think using the library is also a good way to decide if you want to buy a book or not, because sometimes they can be quite expensive (that's when you check the prices on Amazon! ).